A city is the composite of characters, the sale of stories – and no, not the stories in buildings – but rather, the tales of the human topography. Many names and characters, once their neon burns-out, recess into the annals of dusty libraries and newspaper clippings gone dark in travel trunks. In the same way we should keep our buildings, our old viaducts, our worn-out storefronts, so too should we retain and remember the stories of those who came before; those who burned as bright as any gaslamp sign ever did. The good folks over at buckfifty.org have been collecting the vital stories of Denver over the last couple of years (an amalgam of people in the Denver community). On their site I’ve seen photographs and heard stories about old places, now long gone, like: Denver’s 10 viaducts (we used to get drunk below the 16th Street Viaduct in the late 80’s before going in to Paris on the Platte), City Spirit Cafe and Celebrity Sports Center. 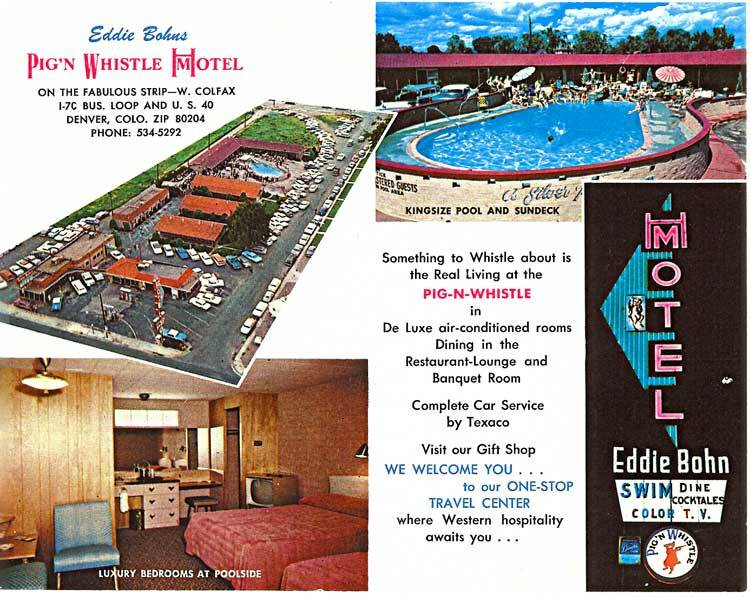 One of those great stories, predicated by a place and a great personality is Eddie Bohn and his Pig ‘N Whistle H/Motel. Read Keith Chamberlin’s complete piece on the charismatic Eddie Bohn and his famous Pig ‘N Whistle, here: buckfifty.org.